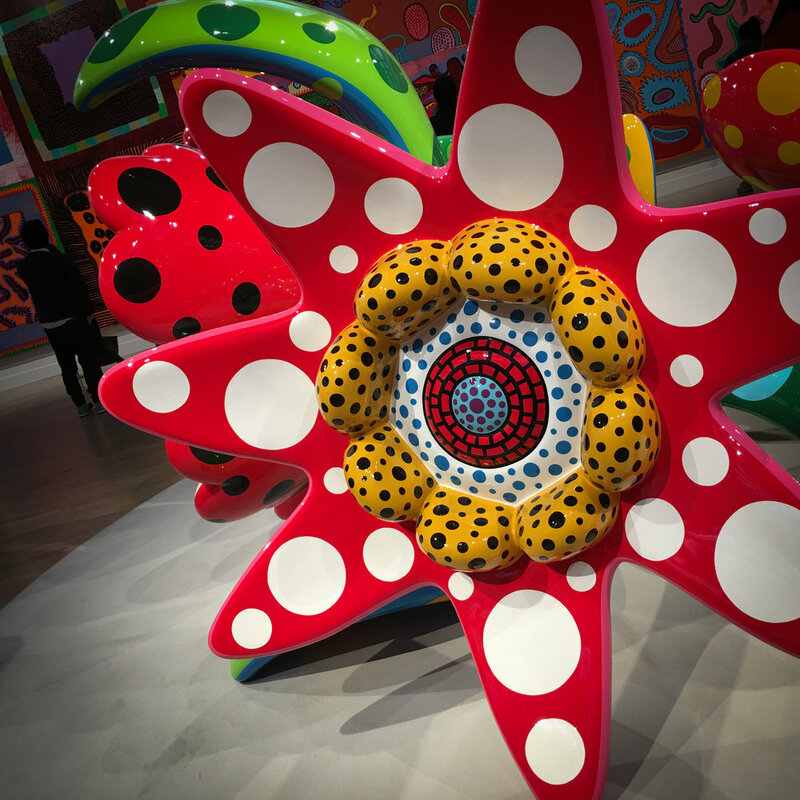 While in Tokyo, I went to see the ‘My Eternal Soul’ exhibit by Yayoi Kusama, a Japanese avant-garde artist. Her work is famous for the patterns of netting and polka dots, that allude to the vivid hallucinations that began as a child. She gained fame in the United States in the 60’s and 70’s continuing her paintings as well as performance art, videos, and installations. In 2012 she collaborated with Marc Jacobs and Louis Vuitton on a line that included handbags and other accessories. Since 1977, she has voluntarily resided in a mental institution in Tokyo for her hallucinations and obsessive-compulsive disorder. Her struggle with mental illness is not unlike other highly successful and creative people through history, and puts her in the company of Andy Warhol, Van Gogh, Hemingway, and Virginia Woolf (just to name a few). Her bright red bob, and polka dot outfits make her appear as though she just stepped out of one of her kooky works of art. The walls of the exhibit were covered in 132 of her brightly colored paintings featuring dots, squiggles, geometric shapes, and flowers. Apparently there are actually over 500 of these paintings, so that means there are over 360 more…now that is crazy!